광산개발 중 발견된 섭동굴은 지하수의 발달단계에 따라 3층 구조를 이루고 있으며, 각 층별 동굴의 발달형태와 이에 따른 동굴생성물이 성장하는 과정을 단계별로 관찰할 수 있는 매우 학술적 가치가 높은 동굴이다. 동굴의 최상층은 동굴의 발달단계상 마지막 단계로 동굴수의 유입이 매우 적어 상대적으로 건조하여 석화와 곡석이 우세하게 자라고 있고, 중층은 우기에 간헐적으로 동굴수가 유입되는 지역으로 종유석, 석순, 석주 등이 분포하고 있으며, 최하층은 지하수가 흐르는 수로가 발달한 층으로 지하수의 유입 정도에 따라 종유석, 석순, 석주, 유석 커튼과 석화, 곡석, 동굴진주, 휴석 등 다양한 동굴생성물이 성장하고 있다. 현재 섭동굴은 동굴 생성물 등의 보호를 위해 공개제한지역으로 지정되어 있어 관리 및 학술 목적 등으로 출입하고자 할때에는 문화재청장의 허가를 받아 출입할 수 있다. Seopdonggul Cave was accidentally discovered during mine development work. The cave consists of three levels according to the stage in the occurrence and development of underground water. Each of these levels is distinct, allowing the observation of the cave and its cave formations across different stages of development. The top level, corresponding to the last stage of development, is quite dry, as only very small amounts of cave water reach it. There is, therefore, a strong growth of cave flowers and helictites that a dry environment promotes, at this level. Cave water only occasionally flows into the middle level during rainy seasons. Stalactites, stalagmites and columns are widely found at this level. The bottom level has well-developed waterways. 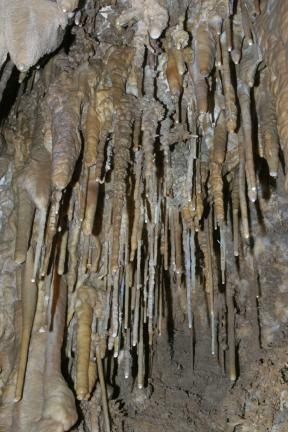 A wide variety of speleothems grow here including stalactites, stalagmites, columns, flowstone curtains (stalactite), cave flowers, helictites, cave pearls and rimstones, depending on the extent of water influx in a given area. To protect these cave formations, access to Sanhodonggul Cave is currently restricted. A prior approval by the Cultural Heritage Administrator is required to visit this cave, whether for its maintenance or for research purposes.